CISS as a technology emerged about 5 years ago and now tens of millions of people around the world are using this product. The print quality when using INKSYSTEM CISS corresponds by 95-99% to the quality of original cartridges. Our range is CISS for most inkjet printers that were released over the past 10 years. “INKSYSTEM” Company welcomes you to our web-site. The company operates in 7 countries with more than 150 regional dealers. Here you can learn more and order CISS (Continuous ink supply system), inkjet printers, all-in-one devices or plotters with pre-installed CISS, refillable cartridges, ink, photo paper, and other accessories for Epson, Canon, HP, Brother, Roland. Printer manufacturers increase the cost of original cartridges by tens of times because they understand that there is no alternative to buy cartridges of other manufacturers after you buy their printer. But now you have an opportunity to think about the printing prime cost in terms of the printing device that you are going to purchase. It is often very important to have a printing device always ready at hand and for reasonable money. You can purchase CISS, refillable cartridges, ink, photo paper, inkjet printers, all-in-one devices or plotters with pre-installed CISS by selecting a menu choice or by using the “Search” menu in the upper part of the web-page. Every client can have the photo paper and ink profiling done for FREE via mail (remotely) or in any of our representative offices. The Company provides official one-year warranty for: Epson CISS, Canon CISS, HP CISS, Brother CISS, refillable cartridges for printers and plotters, ink and photo paper. 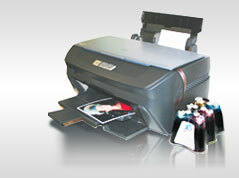 CISS installation in any of the “INKSYSTEM” representative offices is FREE. CIS System for Epson, Canon, Hp, Brother, and even Roland – more than 2000 kinds of inkjet printer, all-in-one device or plotter models (almost all models) produced in the last few years by the listed brands can be upgraded.